What would make my horse life simpler? The 47 minute route is my usual path to the barn. The 49 minute route is my snow route, since it's mostly on highways that get cleared first. 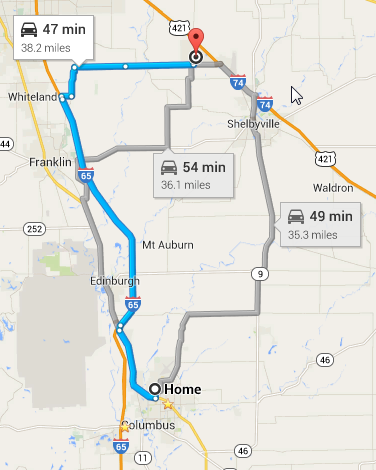 Work is 3 miles south of home, so that makes my post-work drive about 55 minutes. So doing this math, paying $5 for things like the rare blanket change or $10 for holding for the farrier actually makes financial sense, because it's more expensive to get myself to the barn to do the little things than it is to pay for my trainer to do them. I have to make the most of my barn time, and it makes Connor more of a hobby than a pet, which is the unfortunate reality of living 40 miles away. Someday, I want to live close enough to attend to his every need myself. Someday. You won't hear me complain, because this barn is literally my only option, and because it's awesome, and my trainer is worth it. I've been doing it for three years now, if it bothered me I'd have quit a long time ago. The right barn/trainer is certainly worth the extra time and money but I hear you. I would love to live within 5 minutes of my guys someday. Okay, living in our smaller town definitely spoils us in this department. I have a 10 minute drive to my horse! And previously have had my horse a few houses down at a barn. I really don't know how you do 40 minutes, that is crazy! I've done 45min and was down to 20min but am back up to a 30min one-way trip. I don't mind it because the facility is perfect for us. Living in a small big-city means I have to travel to find facilities that aren't ridiculously expensive (the closer to the city, the more expensive they seem to be). Some of the facilities are worth it, some I think charge what they do because they can - the clientele tend to be younger whose parents are paying for the board and don't know other options exist. I read somewhere - Horse Nation? - that had tips for amateur/owners and this gem was listed: "Board your horse between your home and work so you can stop on the way home from work." Are you kidding me? Who has that kind of option? Facilities are hard enough to come by, let alone finding a good option close to either home or work!!! Had to roll my eyes at that one. I've always been lucky to live within about 20 minutes of my barn (except for the one month we were up in the suburbs). When I move next I plan on finding a barn and then hopefully finding a place to live close by. Wow, I can't believe how many of the bloggers I follow in the states have 30-50 minute drives out to their barns! Gosh, and I was contemplating moving because 15 minutes was getting too much. Mind you, when I have two hours to get out there, bring my horse in from the paddock, get the mud off, tack, ride, feed and do general care - 30 minutes of travel time is a big deal all up. I guess you have to make compromises in every situation. I don't know that having the ponies in my backyard would be any less work considering that you'd have to do your own property management - thought that is the ultimate dream of course!